The easy coastal hike starts above the small port of Sol de Mallorca. Opposite house number 40 in the Avinguda Portals Vells, a steep stone staircase leads down towards the water. Already from the top there is a fantastic view to the turquoise water of the bays of Portals Vells. On the right side of the platform, a small path leads to Playa del Rey after a few minutes and a few more minutes later to Playa del Mago, which is very popular with many bathers. Now, behind the restaurant, a cliff path leads from the beach Es Mago to the left to a big, terraced plain from which one then reaches the biggest beach, the Sa Platgeta. The popular beach offers a well-attended fish restaurant in the summer and especially at the weekends many sailing and motor yachts anchor off the coast. We continue to the fourth bay, the Platja de sa Caleta. From there you reach the caves Coves de la Mare de Déu via a staircase and a beaten path. The huge grotto was once used as a quarry where sandstone blocks were quarried to build the Cathedral of La Seu in Palma and the Church of Santa Eulália. It is also said that hippies used to live in this cave. There is not much left of a small altar that stood behind an iron grid at the entrance of the cave. Of course, one also finds countless beer cans and empty wine bottles there, but for the children it is a unique experience to discover this place. From the cave you start the way back again and especially in the winter months we can recommend a picnic at the beach Sa Platgeta, as it offers enough space for running around. For the children there is a lot to discover on this tour. There are many climbing possibilities, small and big caves and of course the beaches. For the whole tour you can plan 2 hours, but depending on how long you stay at the beach for picnic, you can also plan longer. For adults this coastal hike can be extended a bit and more information can be found HERE, but with smaller children it makes little sense to walk further than to the cave. 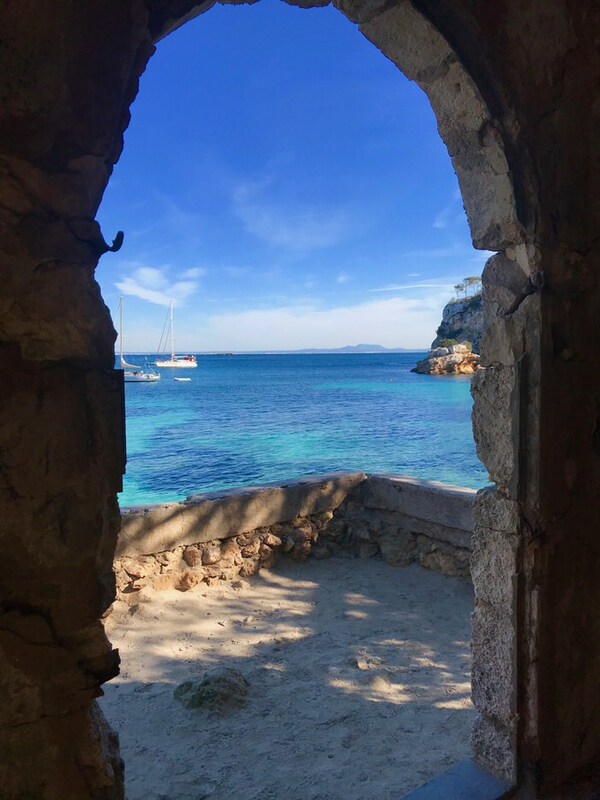 We wish you a lot of fun exploring the beautiful nature of Mallorca.